Olivia Block is a composer and sound artist based in Chicago, IL. Her work centers on electroacoustic composition focused on the use of field recordings, site specific sounds, and other concrete elements to create evolving textures that often have a vague narrative quality that invite into a specific sonic environment. 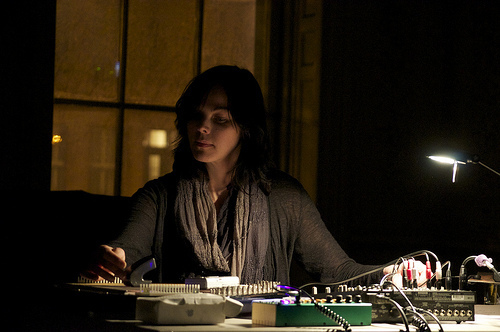 A couple of her most recent works include Sonambient Pavillion, a multi-channel sound installation for the Chicago’s Millennium Park, and her album Aberration of Light. The first time I listen to a recording, it is usually on headphones or at home through my monitor speakers. Sometimes I am avoidant about listening to music, because it reminds me of all of the issues surrounding my own work, and it is not relaxing. However, generally, upon first listen to a recording, I let it wash over me, allowing my first impressions to surface. I can usually tell if I will like something within the first thirty seconds or so of the music. It depends on the type of music, of course. I usually try and learn from the recording in some way. If the music utilizes a lot of studio production I tend to focus on aspects related to that process. My ear is drawn to tiny timbral details and layers within the recording, if they exist. If the music includes people performing, I am still much more focused on compositional or production aspects rather than the performance itself. Additionally, I might wonder how something was recorded—like what types of mics or electronic instruments were used, or where it was recorded or produced, what type of software/instrument/synth was used. Certain types of music lead me to wonder about the formal aspects of the piece more than the production details. I might wonder why the composer made a certain choice, for instance, or I might try and think about the overall arch of the piece. If there are many acoustic instruments I think a lot about the orchestration and arrangement, particularly with orchestral music. I often try and separate the voices in my mind, and learn something from the technique, if I admire the sound of it. I might also go on to seek out the score so I can see what the composer actually did with the instruments. It depends on whether I want the environment to play a large role in my perception of the piece. Some pieces are interesting while played in locations with existing sounds, or very unique timbral/resonant qualities. I find that live music is often best experienced in distinctive sonic spaces, for instance. However, if I want to hear recorded music with no “interference” then I like listening in a quiet space with decent speakers. I always think of art-making as a social process. I would include the above question as part of that process. I tend to learn by observation. For instance, I learn a lot from how friends listen to music–I find listening habits really interesting. It’s interesting when someone I pegged as an audiophile listens to music through bad speakers or only on the phone, etc. At a certain point a few years ago, I thought I was losing my hearing. I would go to the grocery store, for instance, and suddenly notice that the checkout person was looking at me quizzically after asking me a question I didn’t hear. This became a pattern with people-I missed things people said to me and had to ask them to repeat the question or statement. Consequently, I took a hearing test and, while I was prepared to get a low score, I heard every test correctly. I realized that my issue was listening-related and not hearing-related. My ear and brain treated and valued speech as equal to any other sound in the environment, instead of prioritizing it as a more important sound to listen for. So, in the grocery store example, for instance, my attention was more probably focused on the rustling of the paper bag and not on the voice asking me a question. I think this type of listening is a direct result of how I approach my own work and pay attention to the sounds around me when I record or listen to music. Whether or not that is good or useful, I am not sure. During a performance, I am thinking of how the audience is hearing the sounds, so there is an imagined extra layer of listening in addition to my own. This is particularly true if I am set back from the PA speakers on a stage. I have to imagine what the room sounds like for the audience. I sometimes make performance choices based on those imagined sounds rather than the ones I hear on stage. I know that if I am presenting an inside-piano piece live, that the piano I am hearing is very different than the one that is coming through the speakers, and that certain things will sound good to me that will not come through for the audience. I ove your story about the possible hearing loss. Interesting approach to listening VS. Hearing.